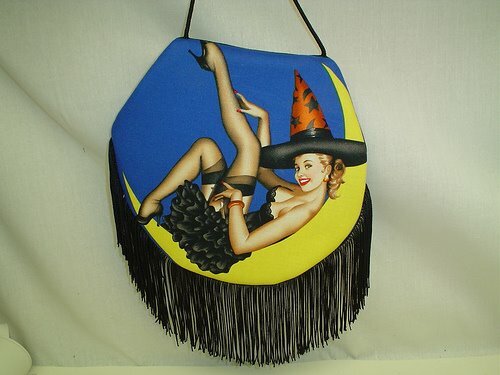 I have been searching for the perfect purse. And I have standards, too. It must zipper and a zippered pocket on the inside. It must have a long shoulder strap. It must be large enough to hold essentials which, in my case, includes the ability to haul around a paperback novel. And it’s gotta look good. I don’t mind if it looks a little funky but I do have to be able to carry it to work and professional meetings and not feel like a dork. You wouldn’t think it would be that hard, would you. A nd I’ve even learned to adapt. I’ve moved to smaller purses. I tried short straps and that did NOT work. Note to self: don’t do that again. I told her that over time she would get many bags and that she would become more discerning about the bags. Do they have zippers? Do they have a lot of pockets? Are the logos tasteful? I told her the best bag from a conference was one my sister got. It was green with a long strap, a zipper, and best of all–it was waterproof. This young librarian didn’t exactly roll her eyes, but she did skeedaddle out of my office pretty fast. She got another job in less than a year, not in the library profession. Mouse decided he could fix it, so we searched all over the store for straps to replace the short ones. Camping supplies–nothing. Hunting supplies…rifle carrier straps were a possibility but not entirely functional. He ended up finding a guitar strap. When I picked up a purse to see if the strap would work, my lip curled in disgust. “It won’t be pretty, will it?” said Mouse. No it won’t. I bought the purse but not the strap. Thinking I can make a strap out of some fabric. Will I do it. Maybe. Will the purse be perfect? No. After carrying it for a week, it’s okay but I already know it’s not perfect. I remind myself, it’s the journey not the purse. I’m going through a renewed bag frenzy lately. I just stopped by to see this, and yes, AH, it just never ends. I’ve been thinking about those Ameribags.Have we discussed this before? fyi, if you are into swapping the strap check out JoAnn Fabrics, they have straps in their purse making supplies section, you might find one that suits your fancy… and… good luck in your search.